Monday, June 11, 2018 was a very busy and stressful, yet exciting day. We got very little sleep, arose very early, and then we had all the running due to our customs error at the Edinburgh airport, not getting checked off on the passports before security. There were so many parts to the day, because we arrived in Bologna, bus to train station, train to Mestre, and walk to our condo. One advantage so far may be that we hadn't walked over ten miles. Almost every Italian neighborhood is near some piazza, a common feature of Italian towns and cities. Our place of stay was near one with a fountain in the middle. Venice is a nighttime city, but in hindsight we slept longer than we should have for the rest of the parts of this day. We walked back to the train station to go the final leg into Venice, which is only about ten or fifteen minutes. It was nice to be rid of the luggage. Where we stayed, we walked east, passing many bicycles. Italy is filled with bicycle riders, peddling along as their actual mode of transportation. Almost all of these bikes look like the retro 1940 simple, plain bike. 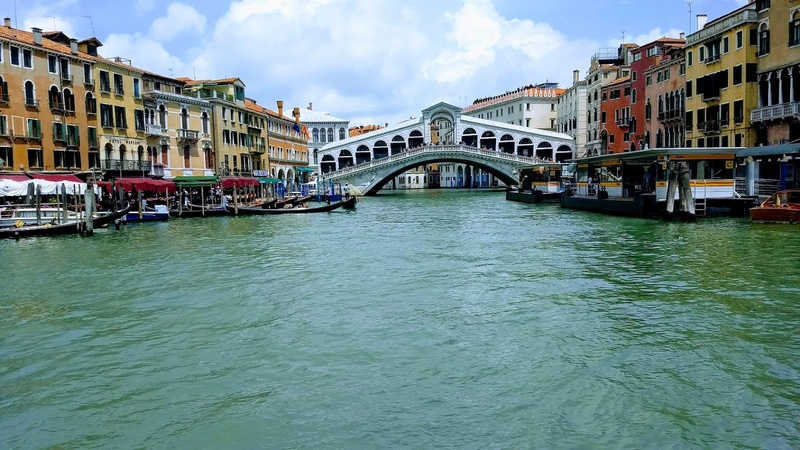 The track to Venice is upon a narrow land bridge to a group of islands, so it looks as though you are coasting along on top of the Mediterranean as Venice grows larger in front of you. The Venice station is a giant one in the very north and west. You walk a short way south and east, down some granite steps to the grand canal. Nothing is like Venice. Wherever you look is different than anything you've ever seen. I led my family to a ticket office right on the canal, where I purchased four vaporetto passes. 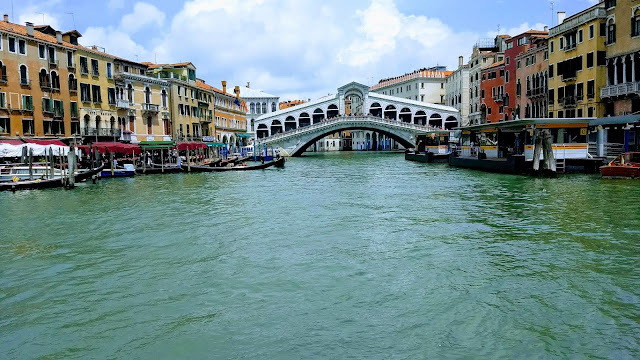 The goal here was to ride the entire grand canal from the very beginning, past Piazza San Marco. Our host, Massimmo, suggested it. It was probably a good suggestion if we had left two hours sooner, which itself would not have been the right move, because we needed the nap. To ride the vaporetto, the water bus, you wait on a little platform, they call a ferrovia. The vaporetti travel both ways. Just to be honest, when I stepped on to the ferrovia, I thought I was on a square vaporetto, because I had never seen one or ridden one. So much of this trip was a first time for whatever it was. We were the first onto the platform, waiting then for the actual boat. As we stood and sat and others followed us, a couple from Chicago walked on, and started the most memorable, hot argument of the entire decoration. She asked a fairly inane question about the direction of the vaporetto and he took offense at the simplicity, so he insulted her. She went back at him, he at her, the volume elevated, and then my wife and I were actually trying to help settle it, calming them both down. They stood then in silence looking different directions. There was plenty to look at. 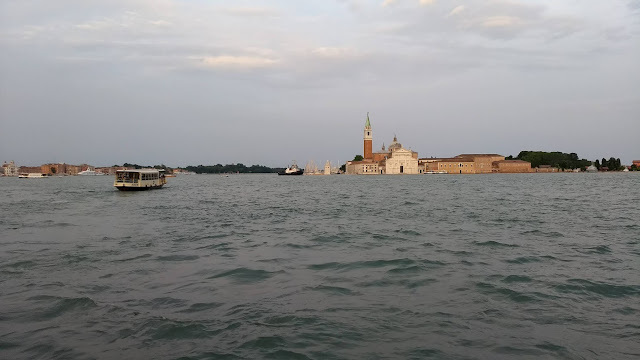 Our vaporetto came into the ferrovia, and it was clear what was happening. This is where people got on and off, off first, of course. The stop has an official and the vaporetto has a captain. They keep their rules strict, and it's easy to see how offended they are at tourists. Tourists in general just want an advantage for themselves to be and go where they want to go. It was different in the U.K. This showed up to the maximum in Italy and France. As much as you might think, Americans are not the worst. Others are by far worse than Americans, and I'll let you know as we go along. 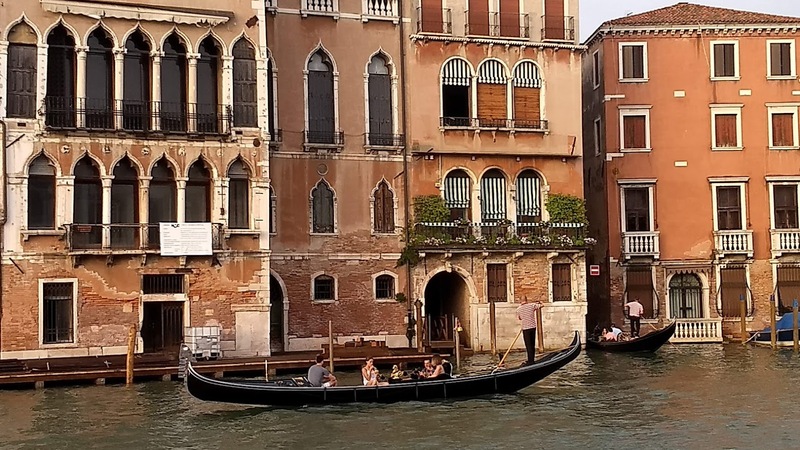 Everything in Venice is unlike anything and that includes the grandness of the Grand Canal. As much as we left late, the colors at around 7:30pm are marvelous. There is so much activity: gondolas, gondoliers, other vaporetti, water taxis, the bridges, and the buildings with the water, the spires, the windows, the little alleys and miniature canals, and surprises everywhere. Venice is very odd. Why would anyone live like this? I get it, but it is still weird. Security. Safety. Protecting money. It started, kept going, built up, and then just became what it is, like anything different in the world. We went from stop to stop to stop, taking in the views and at the end of the canal, it opens up into something wider, more spacious, and majestic. 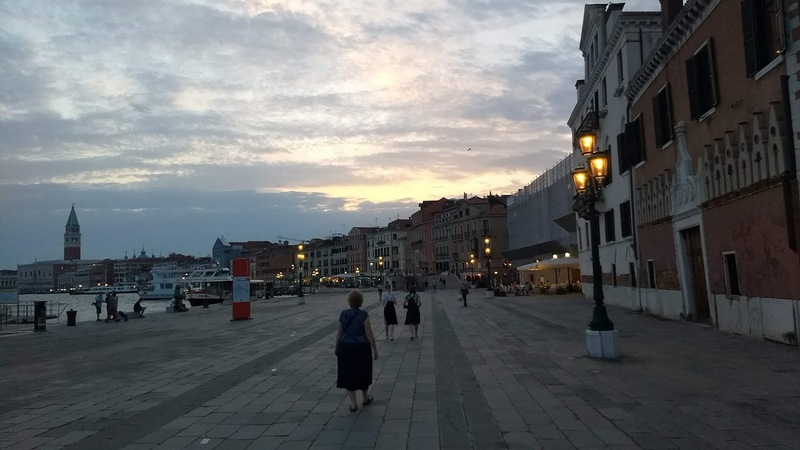 We took our hosts advice, and went a stop past Saint Marcos, the most famous area of Venice. We walked back from there along the canal. Massimmo also told us that we could just keep heading that direction, and zigzagging, and we would make our way back. That was not his best advice, but we were fine for now. The lamps came on, and the temperature was perfect, the breeze coming off the water. We were hungry now, and there are restaurants everywhere. Venice isn't known for its food, but the atmosphere was terrific. We liked the price and selection of a place, so we sat down outside with a view, watching the people go by. It wasn't crowded that night in that special location. We ate pasta of various types and it was wonderful. I liked the service in Italy. It was almost always men, and they were masculine. The waiting seemed to be a craft with them. They weren't doing it for a tip, so it wasn't ingratiating. They didn't attempt to chat you up. They were fulfilling a duty, it seemed, with a time-honored artistry with every movement. They were there to help you, not impress you. I didn't find it different any time in Italy. When we rose to leave, it was dark. There are lamps and lights everywhere. The shops are open. Venice is a maze of alleys and canals, sometimes very, very narrow. At moments you walk into a very narrow alley that has no exit. Sometimes it ends at a canal with no way out. Some of these had very shallow water over the stone walkway, wetting the bottom of your shoes, splashing along. Every view was fantastic, but we were very, very tired. It would have been nice to have beamed to the end and started over fresh on Tuesday. It took me about 45 minutes to figure out that the zigzagging advice of Massimmo was not the correct one, when I started using my GPS. You can put in your destination and make it through in Venice -- just a tip. I did that from then on. It will tell you how long it should take on foot. You have to watch very carefully especially at night. If you remember, I told you about not having walked ten miles. We took care of that with our walk through Venice late at night. It was a long, long walk. My wife was a trooper, because all things considered, this was a painful march. Once we were in the middle of it though, it was too late to turn back. We saw some amazing things that night, that were overshadowed by the exhaustion. We were late for the last train, arriving at the transportation hub where we started just after midnight. We caught the bus though, which traveled all the way right next to where we were staying. You might think that people everywhere would know English. They don't. You are in a foreign country at a bus stop. However, there isn't the feeling of a threat that you might feel in the United States. The main suggestion is keep track of your purse and backpack, your belongings. Before we left on the trip, I bought two cargo pants, and a new billfold, one easy to carry in a front pocket, and I kept it in the zipped pocket on my thigh. My wife and daughters had security purses and backpacks, anti-theft versions of these. Everything we brought was easy to carry. We always had our passports and they were in rfi safe holders. We didn't have a problem the entire trip with that. We slept well that night, and late morning we would make our way back to Venice on Tuesday. 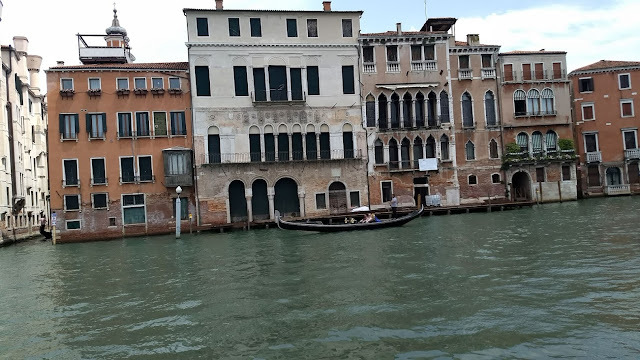 I'll talk more about the Venice experience.